When you begin your day with a great breakfast, it's the best start to the day! Experts worldwide agree that breakfast is the most important meal of the day. A large body of international research supports the key role of breakfast in helping both adults and children meet nutrition recommendations. As we literally ”Break the Fast” of 8 to 12 hours without eating, the body and brain need to refuel. A balanced breakfast kick-starts the metabolism and provides nutrients for the brain and body. - switching from a heavy, fat-laden meal to a lighter, grain-based meal that could provide a healthier start to the day. Kellogg's Corn Flakes was the first cereal invented by the Kellogg brothers. Now it is enjoyed by millions of people around the world! 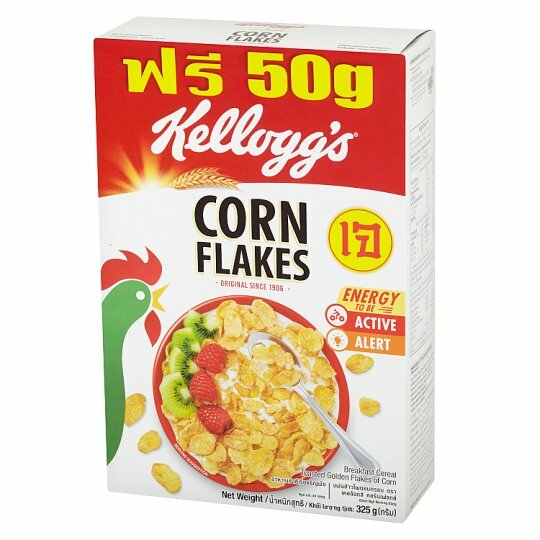 Corn 89%, Sugar, Malt Extract, Iodized Salt, Vitamin E, Vitamin C, Niacin, Zinc Oxide, Reduced Iron, Vitamin A, Vitamin B6, Vitamin B2, Vitamin B1, Vitamin B12, Folic Acid. Contains Gluten and soy bean. May contains traces of peanuts, almond (tree nut). *Percentage of the Nutrient Reference Value per serve.